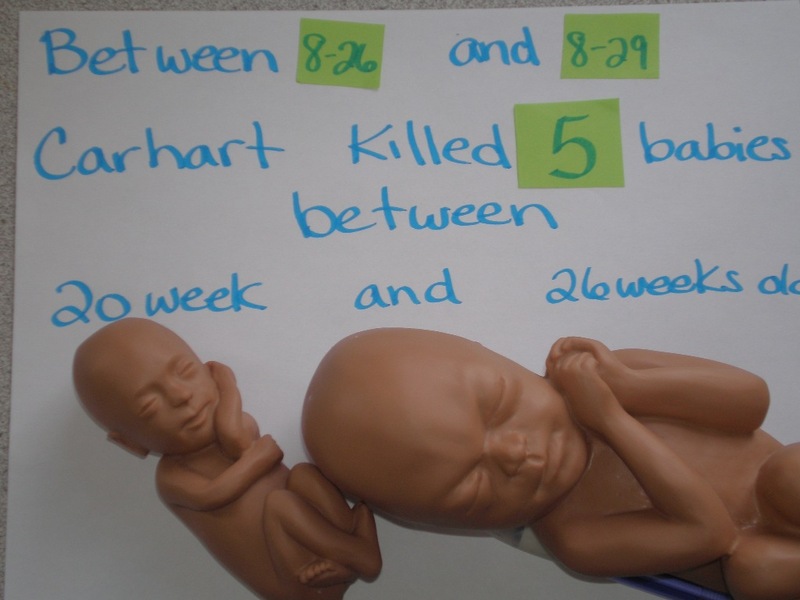 Yes, you read that right…5 babies between 5 months and 6 1/2 months gestational age were killed by Carhart JUST THIS WEEK. You may already know, but my wife and I are expecting baby girl this December! This week, our little girl is 24 weeks. This is a little girl who we have seen in 3D ultrasounds, who has her own distinct and unique face that we have fallen in love with, whose heart we have heard many times at the Doctor’s office, and who “reaches out” for us each night before bed – by kicking and punching from inside my wife’s belly! Are you kidding me? When is the general public going to wake up?!?! 5 babies, just about the same age as my first daughter, were killed JUST THIS WEEK by Leroy Carhart. 1. What are YOU doing to stop the killing of innocent babies? I encourage you to seek God…TODAY, and ask Him what you could be doing to help save the lives of HIS children. Or, ask Him what MORE you could be doing to save the lives of HIS children. One opportunity to do more is just around the corner. The Fall 40 Days for Life campaign starts in just 26 days. And 40 Days for Life campaigns from all across the state (and Washington DC) have joined together to hold a Statewide Kickoff Rally on Saturday, September 22nd at 10am. There will be 2 different locations, so no matter where you live in the state, you can join with your Pro-Life brothers and sisters in person and prepare for the Fall campaign. The 1st hour of the Rally will be a LIVE webcast from Germantown, online pharmacy viagra with David Bereit, Caitlin Jane, and a SPECIAL guest speaker you don’t want to miss – as well as personal video presentations by Christian Music Artist Matt Maher, American Values President Gary Baurer, and others. For more information about the event, and to REGISTER NOW, please visit http://2012marylandkickoff.eventbrite.com/, and please share this info with everyone you know! On August 8th, the MD Board of Physicians suspended abortionst Harold Alexander’s Medical License…and on August 22nd the AFFIRMED that suspension (read more)! You can read the actual letter of affirmation from the MD Board of Physicans HERE. Remember Harold Alexander? 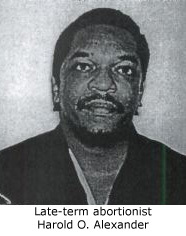 He is the abortionist in Forrestville, MD, who has been charged by the MD Board of Physicians with “sexual boundary” violations, botched abortions, shoddy or non-existent record keeping, evidence tampering/destruction, and the illegal prescribing of large amounts of Viagra and other drugs to himself and non-patients (read more) – AND – he has he been working with an unlicensed, out-of-state abortionist named Pendergraft and operating an illegal late-term abortion scheme based out Maryland (read more). Over and over, abortionists show their True Colors…at least 1 more killer has been stopped – at least for now. And just this month (August), we’ve seen 2 lives saved as a result of faithful PRAYER and ACTION at the Annapolis Planned Parenthood (which is the only abortion facility left in Anne Arundel County)! Click on the links below to read about both events, and see how this strategy of praying and being present at Abortion Centers DOES save lives! As August comes to a close, please continue to PRAY that God closes down the Annapolis Planned Parenthood (and all abortion facilities in our state) and that He makes this month the LAST month of late-term abortions that Leroy Carhart ever conducts in Maryland!! Thanks for posting this. You state the truth very well, and without equivocation. People are waking up, the life issue has won the day, the proaborts simply don’t realize they have already lost, which is exactly what one MCP officer in Germantown told me one day, saying: “You guys have already won the debate”. Thank God for an honest police officer, who knows the ugly truth of what is going on inside the Wisteria Death Center. God bless you!